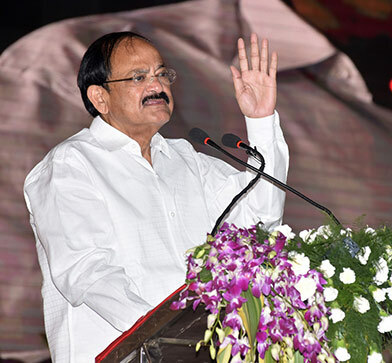 New Delhi: The Vice President of India, Shri M. Venkaiah Naidu has said that literacy provides the first essential step towards building a participative, vibrant, and a more inclusive democracy. He was addressing an event organised on the occasion of International Literacy Day, here today. The Union Minister for Human Resource Development, Shri Prakash Javdekar, the Minister of State for Human Resource Development, Shri Upendra Kushwaha, the Minister of State for Human Resource Development and Water Resoources, River Development and Ganga Rejuvenation, Dr. Satyapal Singh, the Secretary, Department of School Education & Literacy, Shri Anil Swarup and other dignitaries were present on the occasion. The Vice President Said that the Literacy Day reminds us of the importance of literacy in the development architecture of all countries and its crucial, central role as a development accelerator. He further said that literacy helps individuals to access and exercise various rights and entitlements provided to them under the Constitution. Literacy a stepping stone for all forms of formal learning as well as lifelong education, literacy enables individuals to access and avail economic, political and social benefits, he added. The Vice President suggested ways to achieve universal literacy; firstly to improve the quality of pre-primary and school education; secondly, we must provide opportunities for learning to those who have never been to school or have dropped out of school. The Vice President said that Neo-literates, majority of who are women, will be the ambassadors of our programme leading towards making Saakshar Bharat a Saksham Bharat. He further said that we must use technology to make the literacy programmes more effective. Digital learning materials can address the diverse learning needs of different age groups more effectively, he added. The Vice President said that literacy learning can be made more meaningful if it is linked to the daily lives of the learners. He further said that community learning centres can become the hubs of literacy learning and community empowerment. Let us create a new India built on the strengthened base of a literate, educated, empowered population, he added. “I am extremely happy to be with all of you in the national celebration of the 51st International Literacy Day. Today is a very special day dedicated to literacy that has been celebrated world over ever since UNESO accepted the recommendation of the World Congress of Ministers of Education held at Tehran in 1965. This day reminds us of the importance of literacy in the development architecture of all countries and its crucial, central role as a development accelerator. It is a day when we recollect our freedom struggle and the words of Mahatma Gandhi who had said that mass illiteracy is a sin and shame which must be liquidated. It is a day when we reflect on our progress over the last 70 years, as Pandit Nehru so eloquently put it on the midnight of 15th August 1947, “to bring freedom and opportunity to the common man, to create social, economic and political institutions which will ensure justice and fullness of life to every man and woman”. As we take stock of what we have achieved over the years, we can look back with pride at the many milestones we have crossed in our journey. Only 18 percent of our population could read and write in 1947. Today, nearly 74 percent of our population have acquired the basic literacy skills. Over 95 percent of children are in school and nearly 86 percent of young people are functionally literate. It is not a small achievement. However, we have to draw inspiration from our past successes and move forward in the years to come. We certainly have a long way to go. We cannot ignore the fact that today nearly 35 crore youth and adults are outside the literate world and therefore are unable to participate effectively in contemporary India’s development and growth. Add to this about 40 percent of our school children are not acquiring the basic literacy skills proficiently enough even after completing the cycle of elementary education. We have a formidable challenge that needs to be recognized and systematically addressed. Today provides an opportunity for us to celebrate our collective achievements. It is an inspiring saga of untiring efforts. Many individuals and institutions have contributed to this national effort. The enlightened rulers of Travancore and Baroda expanded education opportunities. Inspired by Mahatma Gandhi, Welthy Fisher and Laubach set up Literacy House in Lucknow in 1953. There were active campaigns for adult literacy like Grama Shikshana Mohim in 1959. Excellent momentum was generated through the 1990s by the Government of India’s National Literacy Mission. Thanks to these efforts, nearly three fourths of our population today can read and write. However, the challenge still remains and acquires a sense of urgency in the current Indian and global context. The government believes, as Prime Minister Modiji reiterated at the BRICS conference in Xiamen, China on 5th of September, 2017: “The bedrock of our development agenda lies in the notion of ‘Sabka Saath, Sabka Vikas”- that is : Collective effort, inclusive growth”. The country is also embarking on a faster development trajectory to shape a new India in the next five years. Globally, we have committed to the implementation of the 2030 Agenda for Sustainable Development adopted by all nations at the United Nations in January 2016. The global agenda envisages a “world with universal literacy” and one of the targets set in the agenda, to be achieved by 2030, is specifically focused on youth and adult literacy. “By 2030, ensure that all youth and substantial proportion of adults both men and women achieve literacy and numeracy”. If we have to move at a faster pace and achieve a literate world by 2030 and India has to ensure that all youth and a substantial proportion of adults acquire these skills, we may have to review our past strategies and after an assessment of what has worked and what has not, learn from successful examples from within our country and outside. We may have to chalk out new ways to reach out to those learners who have not been reached till now. Clearly, this has to be a collective effort with the government leading the process but with the active involvement of civil society and the private sector. It has to be a societal mission with a clearer understanding of the catalytic role literacy can play in shaping a new India. I recall the words of a famous Telugu poet Gurajada Apparao who had said: “Deshamante Matti Kaadoy, Deshamante Manushuloi” (Country is not the land under our feet but it is the people who live on the land). It is the quality of life of the people which characterizes a country. It is the equality that determines how the fruits of development are shared. We have a commitment to inclusive growth. We consciously adopt the ‘antyodaya’ approach to reach out to the poorest of the poor. We design programmes that don’t leave any one behind. Against this backdrop and underlying guiding principle of ‘Sabka Vikas’, it is obvious that literacy provides the first essential step towards building a participative, vibrant, and a more inclusive democracy. Literacy helps individuals to access and exercise various rights and entitlements provided to them under the Constitution. It is seen that problems like poverty, infant mortality, population growth, gender inequality are better resolved by a literate society. Besides being the stepping stone for all forms of formal learning as well as lifelong education, literacy enables individuals to access and avail economic, political and social benefits. In the Indian context, literacy can play an important role of empowering, transforming and improving quality of life of individuals as well as society, especially women and those belonging to disadvantaged groups of society. We should continue to strive to achieve universal literacy through the two pronged approach we have been following earlier. First, we must improve the quality of pre-primary and school education to ensure that all children graduating from school have the necessary literacy skills. Second, we must provide opportunities for learning to those who have never been to school or have dropped out of school and those young people and adults who need to acquire basic skills to expand their livelihood opportunities. Keeping in view the importance of literacy in the individual’s life and society as a whole, the Government of India have adopted Saakshar Bharat and Sarva Shiksha Abhiyan as key programme instruments which are being implemented in the country. The Saakshar Programme is primarily focused on promotion of literacy in rural areas of low female literacy districts and this has also helped in establishment of an institutional framework for promotion of adult education centres right up to the Gram Panchayat level. I am glad that the focus has been on female literacy because of its potential multiplier effect on societal development as a whole leading to better health outcomes and nutritional status. It is indeed heartening to note that every year more than one crore adult learners appear in the bi-annual Learners Assessment Tests held across the country and that around 6.66 crore learners have successfully passed the Assessment Test conducted by National Institute of Open Schooling up to March 2017, of which about 70 per cent are women. I firmly believe that these neo-literates, majority of who are women, will be the ambassadors of our programme leading towards making Saakshar Bharat a Saksham Bharat. I am happy to learn that National Literacy Mission Authority (NLMA) is not only engaged in imparting basic literacy to the adult learners but has also ventured to forge convergence and partnerships with various agencies to link literacy with other dimensions of socio-economic development like electoral, financial and legal literacy, primarily amongst rural women. I am told that under financial literacy, a special drive was undertaken in Saakshar Bharat Districts to mobilize more than one crore Saakshar Bharat learners to open and operate their bank accounts under Pradhan Mantri Jan Dhan Yojana. NLMA also participated in Suraksha Bandhan drive for Pradhan Mantri Suraksha Bima Yojana. NLMA’s state partners such as State Literacy Mission Authorities (SLMAs), State Resource Centres and Jan Shiksha Sansthans successfully motivated over one crore beneficiaries to avail benefits of this scheme. I have been informed that apart from these initiatives, NLMA has also taken proactive initiative for alignment of Saakshar Bharat with Saansad Adarsh Gram Yojana (SAGY) in achieving cent percent literacy in respective Gram Panchayats. Large number of Members of Parliament, who had visited the Saansad Adarsh Grams adopted in Saakshar Bharat Districts reportedly, had the opportunity to appreciate these efforts and give guidance to these activities. Concerted efforts in Saansad Adarsh Grams have yielded good results and hopefully such efforts would be gradually extended to cover other Gram Panchayats. Literacy programmes can add significant value if they can be creatively linked to the ongoing initiatives of the government like Swachh Bharat, Pradhan Mantri Jan Dhan Yojana, PM Suraksha Bima Yojana, PM Ujjawala Yojana, Beti Bachao Beti Padhao, Digital India Mission and Skill India Mission. Significant achievement in terms of literacy rates as reflected in Census data over the decade is primarily on account of expansion of elementary education supplemented with implementation of a series of adult education programmes especially Saakshar Bharat. In addition, enforcement of RTE Act, for all children has also helped in reducing the pool of adult illiterate population. However, despite all these significant policy interventions, India continues to have a large population of illiterates. We are home to one third of the total illiterate population of the world. I think it is an opportune time for all of us to undertake a comprehensive review of the programme/ activities undertaken and to identify the critical areas which still need to be addressed. I am happy to learn that Human Resource Development Ministry has decided to redesign the Saakshar Bharat programme to make it more focused and to ensure that all children, youth and adults acquire the literacy and numeracy skills required for more effective functioning by 2022. I am equally happy to learn that in the new variant of the Saakshar Bharat Programme, the school/college students are likely to be involved, for teaching their illiterate parents, grandparents and their neighbours. We must use technology to make the literacy programmes more effective. Digital learning materials can address the diverse learning needs of different age groups more effectively. Literacy learning can be made more meaningful if it is linked to the daily lives of the learners. Community learning centres can become the hubs of literacy learning and community empowerment. I am glad to note that India is a part of the UNESCO-led initiative called the ‘Global Alliance for Literacy within the Framework of Lifelong Learning’. India can take a lead in contributing to this global effort to transform the literacy landscape of the world in the next 15 years. Before I conclude, I would like to congratulate all those who have received the Saakshar Bharat Awards for their outstanding contribution in the field of adult literacy. The good work done by the awardees can be an inspiration for others to carry forward the programme in other Gram Panchayats, Districts and States. I take this opportunity to call upon all stakeholders, including State Governments, Civil Society Organizations, NGOs, Corporate Bodies, the intelligentsia and my fellow citizens to join hands in transforming India to a fully literate society. I would also like to exhort all the stakeholders and beneficiaries in the field of literacy to fulfil the vision of Mahatma Gandhi and the founding fathers of our constitution. Let us create a new India built on the strengthened base of a literate, educated, empowered population. Let us realize that heaven of freedom dreamt of by Gurudev Rabindranath Tagore: “Where the mind is without fear and the head is held high, where knowledge is free; where the world has not been broken up into fragments by narrow domestic walls”.